classes passenger debut the previous week- which by all accounts was in far better weather conditions! First appearing in 1962 the Southern Region's class 73 have become known as a reliable workhorse on the 3rd rail electric systems of South-East England. The locomotives run well on the electric current and their supplementary diesel engines have proved versatile, taking them off the juice on many occasions, but rarely far from their home territory. In the early to mid 2000's as the class lost their passenger work on the Gatwick Express and had all but been consigned to history on freight workings it appeared that the class 73 was reaching the natural end of it's life. GBRf then took on four locomotives for infrastructure work and have grown their fleet ever since, the versatility and reliability of the electro-diesels once again proving itself. Clapham Junction on a deliver run from Loughbrough to Tonbridge. In 2013 something unexpected was announced; the class 73 was going to receive a major life-extension. A complete re-build with a new engine and traction package would give this ageing workhorse a new lease of life. The first locomotives to begin their re-build, by RVEL at Derby and fitted with Cummins engines will shortly begin working for Network Rail, however the larger and more 'standard' class 73/9 design is undoubtedly the MTU engined version which has been re-built by Brush at Loughbrough. 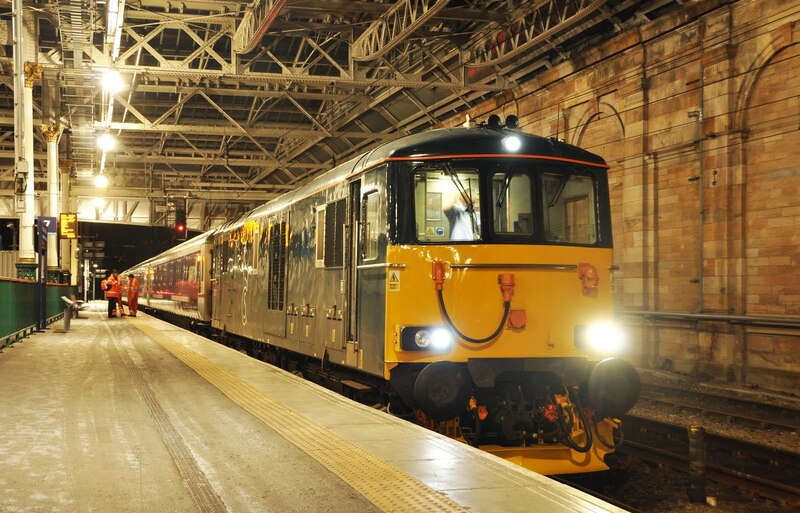 A fleet of more than 10 locomotives will be outshopped from Loughbrough split between infrastructure operations in the South-East of England and in a surprising move, operating the diesel portions of the Caledonian Sleeper train in Scotland. Far from their original area of operation the upgraded 1600hp class 73's will be able to meet the haulage capacities required of them on the routes from Edinburgh to Aberdeen, Inverness and Fort William while also providing train supply to Serco's new fleet of CAF built 'Mk5' sleeper coaches from 2018. Sleeper service on February 20th 2016. The first passenger working north of the border was on Saturday 13th February when 73967 worked the 04:50 Edinburgh - Oban portion of the Highland Sleeper with 73968 dead on the rear for the return trip. The train itself was diverted to Oban as engineering works were blocking the line to Fort William, the 73/9's route availability of 5 making the diversion possible as heavier locomotives are banned on this line. While the locomotives look, and most certainly sound, different they do still retain much of their 'class 73' character with all locomotives retaining their option of electrical working from the 3rd rail and with the Southern based locos also retaining their 27-way multi-working cables (though re-positioned to allow the provision of new lighting clusters). GBRf have signed a 10 year deal with Network Rail to use the locomotives in Southern England and following the significant investment it is likely that the re-built class 73/9's will now be with us for a significant time to come.